In yesterday's post, we looked at apartment rent growth in the metro Denver area, and we noted that rent growth, even though it's been lessening in recent quarters, has been quite strong over the past two years. 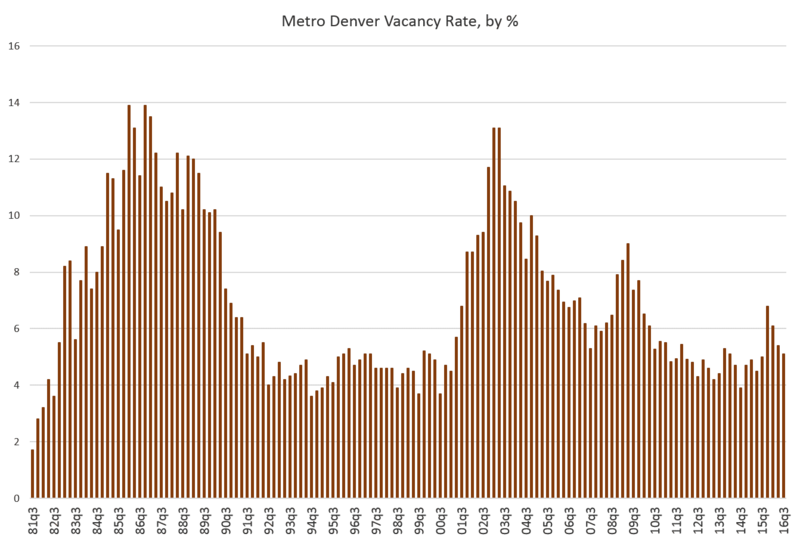 The metro-wide vacancy rate is at a one-year low, but remains higher than during most of what we saw during 2012 and 2013 when population growth was strong, and new housing units were not being produced in the larger numbers that are being produced now. Traditionally, a vacancy rate of five percent has been called an "equilibrium" rate site it tends to imply neither a tight market, nor a market with excess supply. As an example of a tight market, we might look to the vacancy rates during the 1990s when vacancy rates frequently fell to levels near four percent (or even below). With a vacancy rate of five percent, we're likely seeing a reflection of the overall economy in which job growth is solid, and so is new construction in housing. The new construction means that, even with new job growth, demand is not driving vacancy rates down to historic lows as they did in the 90s. 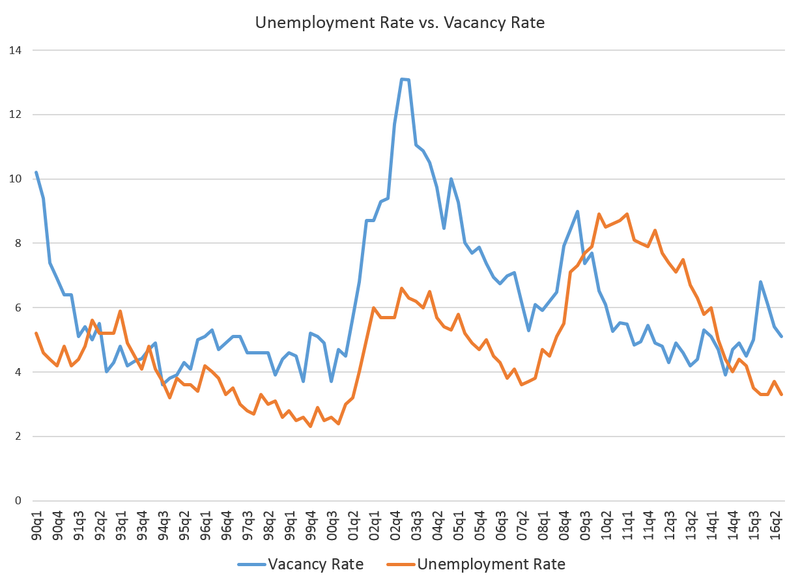 Indeed, one of the larger drivers of the vacancy rate has long been employment. In the second graph we can see how the vacancy rate frequently moved along with the unemployment rate over the past 25 years. when the unemployment rate is low, vacancies tend to be low. When unemployment is high, the vacancy rate tends to be high. In the wake of the 2008 financial crisis and recession however, we saw that the market tightened even as the unemployment rate increased. This was likely due partially to the accompanying foreclosure crisis which drove many former homeowners into rental units. It was also likely due to the crash in housing-unit production that followed the 2008 financial crisis. Today, however, it is likely that we will see the two variables track more closely as housing-production levels return to more normal levels in the absence of large numbers of foreclosures.